Phillips Beer and Broad Street Cycles are proud to present our new Monday Night Rides! Come down to the shop at 6PM on April 8th and 22nd for a 40km "no drop" group ride with the team, and then join us upstairs at the Victoria Events Center once the ride is finished for screenings of Ronde Van Vlaanderen and Paris-Roubaix. 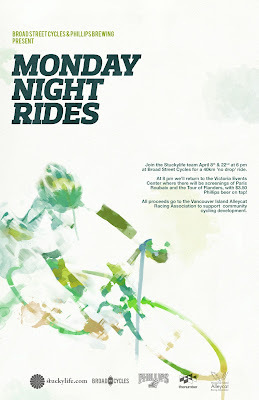 There will be $3.50 Phillips beer on tap and all proceeds go to the Vancouver Island Alleycat Racing Association to support community cycling development. See you there!